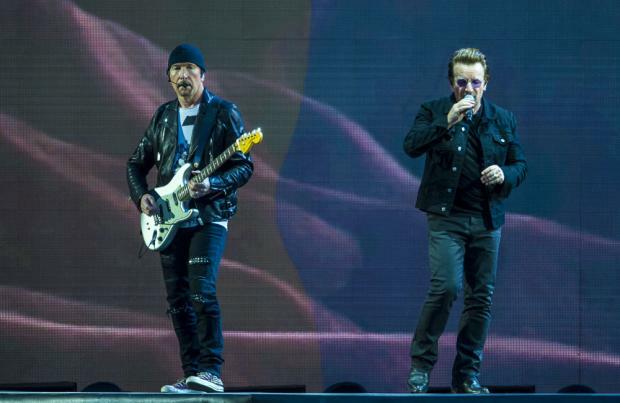 Bono has compared U2's 'eXPERIENCE+iNNOCENCE Tour' production to pulling off a Marvel movie every night. The Irish rockers kicked off the run at Tulsa's BOK Center in Oklahoma in the US on Thursday (03.05.18), and before performing the frontman confessed that rehearsals for the major scale show had gone "really sh*te". The 'Get Out Of Your Own Way' hitmaker describes having to "method act" each song as if he were starring in one of the franchise's superhero flicks, whilst admitting the show is like a "big technical monster". Speaking to The Irish Sun newspaper, he said: "It's sort of like doing a big Marvel movie, except you're taking this to a different city every few days so it's a bit mad -- and worse than that, for me, it's like a Marvel film where you've got to method act, so that's not right. "Something like that you have to get right inside the songs in order to sing them. "It's a big technical monster but it has to have a big bloody heart inside of it, in the machine, and that's what we do. So it is an unusual way." On rehearsals, he added: "It was going really sh**e in the dress rehearsal. I think we put some things in place that will make it a little less indulgent." Thankfully, the ambitious production all came together on the night. The set included a touching tribute to Bono's late mother Iris with his parents' wedding day screened behind him as he sung 'I Will Follow', as well as digs at President Donald Trump. The 'With or Without You' rockers - completed by The Edge, Larry Mullen and Adam Clayton - continue the run with 26 further shows in North America. They'll then head to Europe before heading back home for two shows at Dublin's 3Arena on November 5 and November 6.